Read all rules and make sure your vehicle is qualified and that you have adequate safety equipment because all fees are strictly non-refundable as per our Refund Policy & Terms of Purchase. First and foremost it is important to make it clear that it is solely the participant's responsibility to adequately prepare their vehicle for safe operation. The guidelines we prepare are just that, they are not intended to be comprehensive or any type of certification or guarantee of safe performance. That being said, the sections below explain some of these general guidelines. It is important to note that the AutoInterests tech inspection at an event will serve only as a basic "spot check" of these items: helmet, seat belts/harnesses, roll protection (if applicable), no loose items inside the vehicle, battery is secure, no obvious leaks or loose body panels, and proper attire. Drivers are required to go through tech inspection the morning of the event. If you are driving at a multi-day event, you only need to go through tech inspection on the first day of a multi-day event. Harnesses must be properly mounted in accordance to the harness manufacturer's instructions. Racing seats must be properly secured with no movement. Please view all information pertaining to convertibles HERE. As mentioned in our disclaimer this inspection is not all-inclusive and should not be considered any type of certification or guarantee of safe operation. 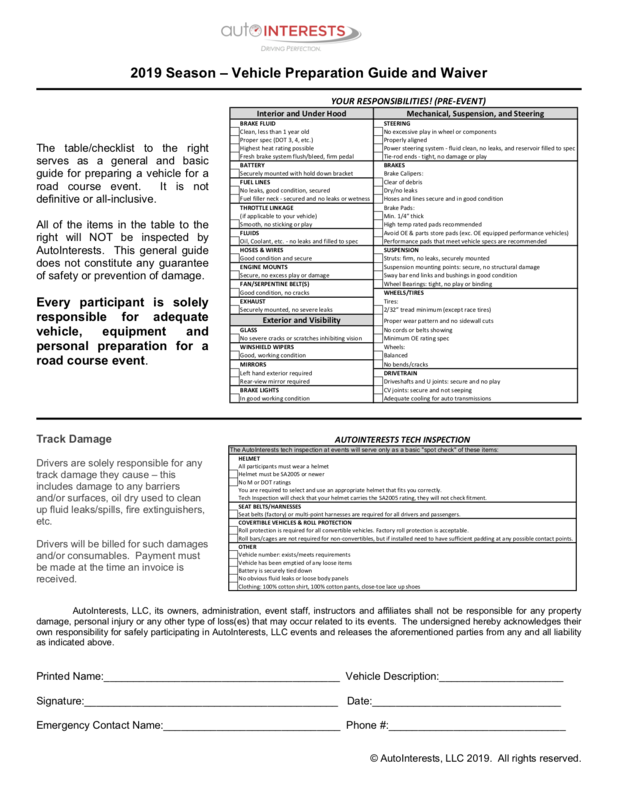 All drivers are required to sign our tech sheet/waiver form acknowledging their sole responsibility for the preparation of his or her vehicle.